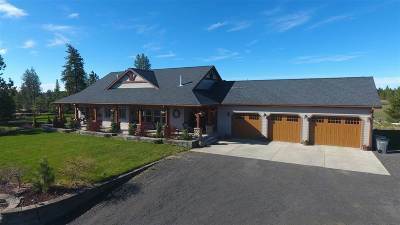 Exquisite custom built home set on nearly 10 acres. The craftsmanship can&apos;t be missed, solid wood doors, arched ceilings, exposed beams, custom cabinets & wood floors. Contemporary open concept w/high-end chef&apos;s kitchen w/dual ranges, wine chiller, granite tops, 3 gas fireplaces throughout. All main floor living w/master en suite, California closets, & main floor laundry, while downstairs is a daylight walkout w/multiple bed & bath. Newer 4 stall barn, attached 3 car garage and fenced raised bed garden.